The Nobel Prize for Chemistry has been awarded to the American Roger Kornberg, a professor at Stanford University in California. The prize was given to Prof Kornberg for his work on the molecular basis of eukaryotic transcription in cells. 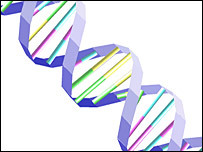 Transcription is an important step in the process by which cells build proteins from DNA. "When the telephone first rang I was completely bewildered," Professor Kornberg said in a telephone interview with journalists in the Swedish capital. "I'm still shaking. I hope I will be able to calm down shortly." Roger Kornberg was the first to create an actual picture of transcription at the molecular level, in eukaryotes, the category of organisms which includes animals, plants, fungi and simple microscopic organisms called protists. His studies on transcription described how information is taken from genes and converted to molecules called messenger RNA. These molecules shuttle the information to the cells' protein-making machinery. Proteins in turn serve as building blocks and workhorses of the cell, vital to its structure and functions. In 2001, he published the first molecular snapshot of an enzyme called RNA polymerase II. Its job is to get the synthesis of proteins underway by copying their genes into RNAs. "Understanding of how transcription works also has a fundamental medical importance," the Royal Swedish Academy said in its citation announcing the award. "Disturbances in the transcription process are involved in many human illnesses such as cancer, heart disease and various kinds of inflammation." Peter Fraser, senior fellow at the Medical Research Council commented: "If the secret of life could be likened to a machine, the process of transcription would be a central cog in the machinery that drives all others. "Kornberg has given us an extraordinarily detailed view of this machine, which is essential for all life." 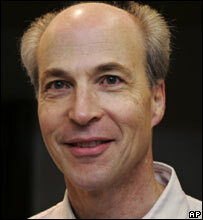 Professor Kornberg is the lone winner of the prize, and the fifth American to win a Nobel prize this year. The 59-year-old is part of the Stanford University School of Medicine in Palo Alto, California. His father, Arthur Kornberg, shared the 1959 Nobel medicine prize with Spaniard Severo Ochoa for studies of how genetic information is transferred from one DNA molecule to another. "I have felt for some time that he richly deserved it," said the elder Kornberg, professor emeritus at the Stanford School of Medicine. "His work has been awesome." Roger Kornberg said he remembered traveling to Stockholm with his father for the Nobel Prize award ceremonies. "I have always been an admirer of his work and that of many others preceding me. I view them as truly giants of the last 50 years. It's hard to count myself among them," he told journalists. "Something so remarkable as this can never be expected even though I was aware of the possibility. I couldn't conceivably have imagined that it would become reality." Last year's Nobel laureates were France's Yves Chauvin and Americans Robert Grubbs and Richard Schrock, who were honoured for discoveries that let industry develop drugs and plastics more efficiently and with less hazardous waste. The Kornbergs are the sixth father and son to both win Nobel Prizes. The chemistry prize is worth 10 million Swedish krona (£723,000; $1.37m).